It’s been fun watching everyday food that I grew up with become chic over the last several years. Southern food has become mainstream in restaurants across the country where top chefs have given traditional southern fare a fresh makeover. When I was growing up in Mississippi, my grandfather tended a large garden during the summer months and every morning he dropped off a basket of whatever was ripe for picking. Fried green tomatoes made it to our dinner table on a regular basis during growing season. My mom simply dipped them in cornmeal and fried them in vegetable oil. Those no-frills tomatoes usually shared the table with fried okra and other traditional southern vegetables. For this post, I wanted to try a slightly updated version of fried green tomatoes from those of my childhood. I introduced a layer of goat cheese under the breading which adds a slightly creamy and tart element to the tomatoes. Traditional fried green tomatoes are breaded with corn meal, but I wanted more of a crunchy texture so I opted for panko bread crumbs. I finished the tomatoes with a chipotle tartar sauce and fresh lump crabmeat. The combination resulted in a delicious twist on an old southern classic. If you’re preparing these tomatoes as an appetizer for a dinner party, make the sauce hours ahead of time and store in the refrigerator. Bread the tomatoes an hour or so before frying. I kept them on a baking rack until I was ready to cook them. Local tomatoes are almost in season, so give this recipe a try and let me know what you think. In the bowl of a food processor, pulse mayonnaise and chipotle peppers until well combined. Transfer to a bowl and mix with pickles, scallions, Worcestershire, lemon juice, Old Bay, anchovy paste, and mustard. Cover with plastic wrap and refrigerate for 30 minutes. 1. Place flour and bread crumb in two shallow dishes. Create an assembly line with the flour, egg, and bread crumbs. Mix salt and pepper into bread crumbs. 2. Spread a thin layer of goat cheese on each tomato slice. Toss a tomato slice in flour, dip in egg, and coat with bread crumbs. Place on a baking sheet. Repeat with remaining tomato slices. 3. Place 1/2 inch of oil in a large heavy skillet. Heat oil to 350 degrees. Drop tomato slices in oil in batches and cook for 2 to 3 minutes on each side or until golden brown. Do not overcrowd skillet. Remove and drain on paper towel Repeat with remaining tomatoes. 4. Top each tomato slice with a dollop of tartar sauce and crabmeat. Garnish with a parsley leaf. Serve immediately. Sounds terrific. You never mention cooking the crabmeat, so I assume you’re referring to meat you’ve picked from steamed crabs, rather than fresh (uncooked) crabmeat. Very upscale and impressive fried green tomatoes. Love everything about them from the panko crumbs and crab meat to the goat cheese & chipotles in adobo mayonnaise. Fantastic job Bill. WOW! Talk about taking fried green tomatoes up a notch or two. Fried green tomatoes are one of those treats that I allow myself a couple of times a years, right there along with fried catfish. Sometimes I’ll fry them both up at the same time; therefore, I can see how crab would be a great topping and a very clever idea I might add. Love everything about these Bill! Right. That’s this weekend done. Think I can find green tomatoes in London? These look delicious and I”m crazy for that chipotle tartar sauce! I’ve never been a fan of fried green tomatoes – hey, I live in Seattle – we don’t know, what we don’t know! But these little beauties…with the goat cheese and chipotle? Oh yeah, these I could learn to love! I love the idea of goat cheese in fried green tomatoes! I wish I had thought of that. Definitely going to steal the idea. Love the chipotle tartar sauce, too. I do make something similar sometimes — but I like chipotle in anything! 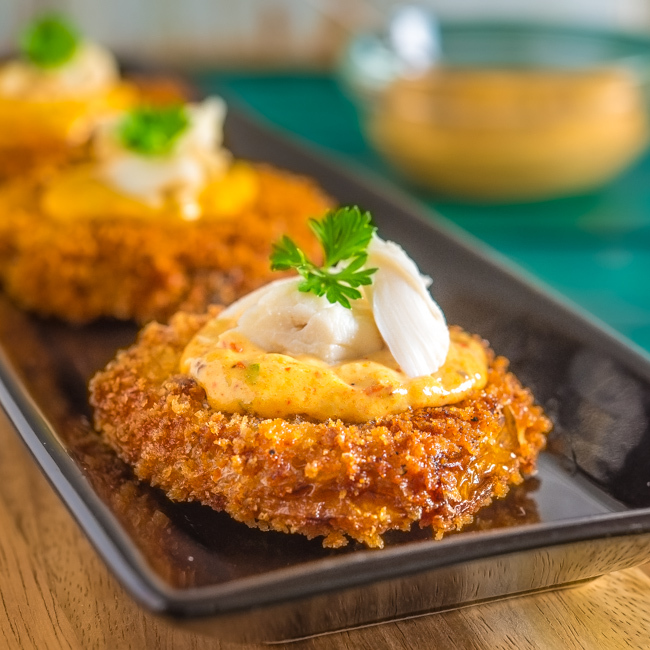 What a great recipe-this lifts Fried Green Tomatoes to a new level. Bravo! Do you know that I have fried green tomatoes on my list of things to make this year? This looks so incredible, I simply must make them now!! I absolutely adore fried green tomatoes. I can’t get enough of them in the summer. But this version? Woah. They are unlike any other I’ve seen and I just want to eat them all in one sitting.